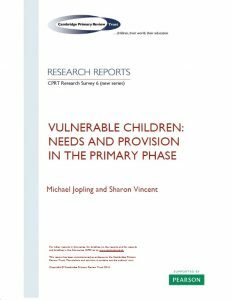 Jopling, M., & Vincent, S. (April 2016) Vulnerable Children: Needs and Provision in the Primary Phase. York: Cambridge Primary Review Trust. 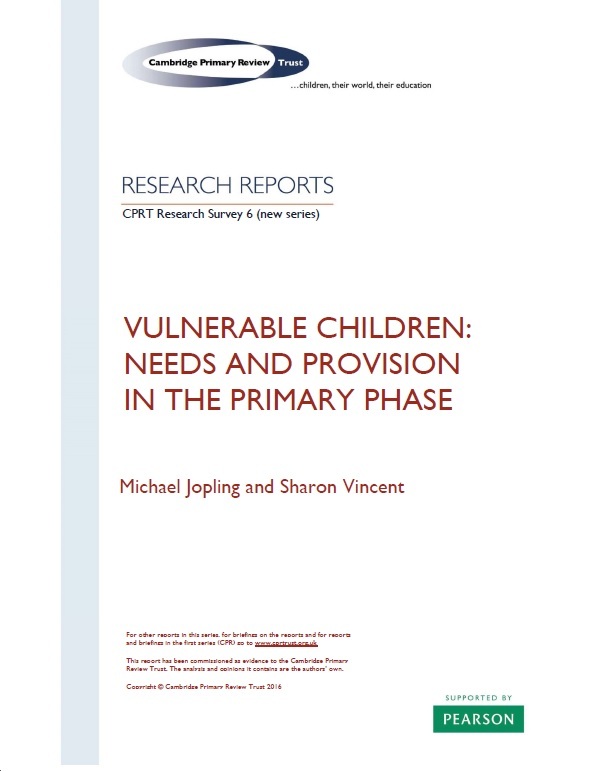 This survey will assess how far policy in this area has advanced since the Labour administration of 1997-2010 which, especially in its last phase, had a strong focus on vulnerable and disadvantaged children and aimed for ‘joined up’ support services. The work will (i) clarify the terms and scope of ‘vulnerable’; (ii) identify different categories of vulnerability; (iii) summarise the circumstances and needs of each group within the broad definition. It will also outline recent policy initiatives aimed at meeting those needs, and assess the strengths and weaknesses of these policies. It will outline a representative range of in-school responses to their needs and conclude with recommendations for policy and practice.